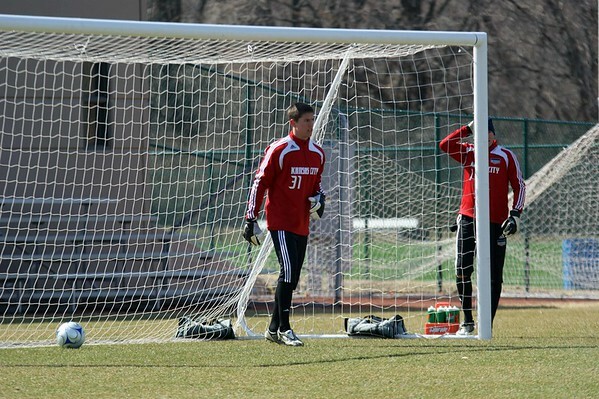 Former Rockhurst keeper and Wizards trialist Chad Becker has been signed by AC St. Louis in the NASL. Becker is a local product for AC St. Louis since he is from nearby St. Charles. AC St. Louis also announced signing forward Gauchinho, Cassiano, Goalkeeper Alex Duffy who was with Red Bull NY and midfielders Gilbert Pogosyan and Jeff Cosgriff. The Kansas City Wizards won the weighted lottery for the rights to US U-17 National Team player Luis Gil yesterday but he was not around for long. Gil had signed a contract with MLS to play for either Real Salt Lake or Seattle Sounders FC. Wizards president Robb Heineman made an effort to talk to him about staying but ended up trading him to Real Salt Lake today for a 25 percent portion of future transfer fees, a 2nd rounder in 2011 and an international slot. Last Friday I stopped by Wizards practice despite the weather. I was a little busy over the last few days so I am a little late getting this posted but thought you would want to see some of your dedicated players practicing.